On a recent trip, I came across a little canvas sign that resonated with me and became one of those “need” purchases that now adorns a previously empty spot on the wall of my home office. Don’t stumble over something behind you, it says in a pretty, clean font. It’s a simple saying with profound implications, and it struck a chord with me because I’ve lately found myself tripping over events and occurrences in the past. It seems natural that a past event would be just that—in the past. Yet unfortunately, the ghosts of yesterday’s hurts have a way of creeping into the present all too easily and often. This small piece of wall décor revealed a big problem for me: namely, that on many occasions, I’ve allowed past occurrences to dictate future ones. In doing so, I’ve allowed bygones to undermine the future’s joy and happiness. Can you relate? I don’t know about you, but I continue to be amazed at the difference in forgiving and walking in forgiveness. 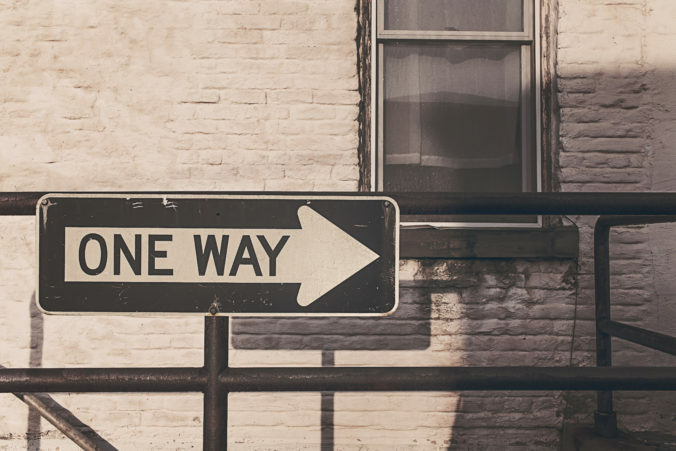 Finding the strength and grace from our Father to forgive a grievance is hard enough … but how can we learn to then walk forward in that forgiveness, leaving the past where it rightly belongs? Walking in forgiveness, especially when we’ve been deeply hurt, requires us to dig in and stay digging in—to God’s power and sustaining resources, and to obedience as we make the choice to not allow the past to reach into our future. God continues to impress upon me how incredibly vital it is to hone and cultivate this skill. The unfortunate truth is, we hurt each other—often the ones we love most! Whether intentional or not, we bump up against each other, rub one another the wrong way, say or do the wrong thing in the blink of an eye … it isn’t always easy to live and function on this earth with one another, loved ones and strangers alike. But unless we plan on isolating ourselves in some far-reaching mountain home (which sounds kind of nice sometimes, right? ), we have to learn how to function and thrive in the messiness of difficult relationships. Last year, I wrote an article about this very topic for the Inspire Forgiveness Anthology, and I have to laugh a little at how God works. He is always faithful to keep me honest and humble. Just when I think I’ve “got it,” He lovingly pulls back the layers of my heart a little deeper and presses in a little firmer … that refining fire never seems to go out, and its heat reveals how deeply I need Jesus, every moment of every day! We’re all familiar with the saying “forgive and forget,” and while this sounds great in theory, the truth is, we must be intentional about forgetting past hurts and grievances against us. Brothers and sisters, I do not consider myself yet to have taken hold of it. But one thing I do: Forgetting what is behind and straining toward what is ahead, I press on toward the goal to win the prize for which God has called me Heavenward in Christ Jesus (Philippians 3:13-14 NIV, emphasis added). Paul acknowledges the ongoing process of “forgetting,” and we are wise to embrace this truth. In doing so, we refuse to grant the enemy any room to plant a seed of bitterness in the fertile soil of our wounded hearts. It may take days or months or even years, but with God’s strength, we can consistently choose to set our minds to forgetting and press toward the goal of walking in forgiveness. The path to consistently walking in forgiveness begins in the kinetic, volatile battleground of our minds. Romans tells us to be transformed by the renewing of your mind (Romans 12:2 NIV). Rather than allow our minds to dwell on what’s been done to us and the witty comebacks we’d love to go back and say, we must commit to the daily, difficult work of taking captive every thought to make it obedient to Christ (2 Corinthians 10:5 NIV). Guard your heart above all else, for it determines the course of your life (Proverbs 4:23 NLT). But I tell you: Love your enemies and pray for those who persecute you, that you may be children of your Father in Heaven (Matthew 5:44-45 NIV). This is such a difficult principle to apply, but it’s truly like a “wonder drug.” One moment of genuine prayer on behalf of someone who has wronged you has the power to soothe your soul and release those chains holding you in the past. These chains our enemy would have us believe to be unbreakable are broken by the redeeming power of His grace. What I’ve learned beyond a shadow of a doubt is that the Lord is faithful to those who love and earnestly seek and obey Him—even when it’s excruciatingly hard, and perhaps even especially in those times. Dear reader, I know it’s hard to put these principles into practice—I struggle with them regularly! But give God a chance to show you just how powerful He is in your hurt—step out in faith and let it go. We can’t reverse the offenses that have been done to us, nor can we change our past … but we have a loving Heavenly Father who can change our future! You have nothing to lose but the dead weight of a past that’s over and done. Let’s commit to refusing to stumble over something behind us. Set it down, leave it there, and walk forward in the glorious freedom of His all-sufficient grace. 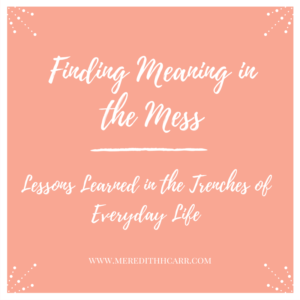 This post is a part of this summer’s series Finding Meaning in the Mess. All summer, we’ll be diving into the faith lessons we can learn in the midst of our everyday lives. God can teach us through all kinds of trials, big or small–let’s commit to drawing nearer to Him and hearing His voice! So what about you–how are you learning to walk in forgiveness, even when the past threatens to undermine your future? Share your thoughts with us! Meredith, I applaud your words of true wisdom and insight and your extraordinary transparency. Forgiveness is not easy, but it is the only way to live in peace and be pleasing to God. Thank you for sharing these gifts God has given you to enlighten and encourage others! Sherryl, thank you so much for your kind and encouraging words! It means a lot–and yes, you are quite right, as hard as forgiveness is, the other option simply doesn’t work :-). Blessings on your weekend! Amen sista! I love the saying on the sign, Don’t stumble over something behind you. That is awesome! Thank you for the sweet reminder that we always have to forgive, no matter how hard it is to do. Blessings! Thank you, Kelsey! I love having that sign as a daily reminder–I need it! Blessings on your weekend, and I’m excited to share your guest post on Monday! :-).